The weather outside may be frightful, but even in the depths of winter; the miniature garden sure is delightful! Although the sun hides away, and the snow never seems to stop falling, life in the fairy garden continues to flourish. Do not be afraid to extend your hobby into the winter months - whether you move some of your gardens inside, or create new container gardens on a covered porch. If you have above freezing temperatures you can keep building a fairy community outside in the snowy landscape; winter can be an enjoyable time to work in the garden—especially if you treat yourself to a cup of hot cocoa afterward! Frequently we picture miniature gardens as warm, sunny places where fairies frolic with pixie friends and mischievous trolls create lively adventures. Nevertheless, winter does come around again each year, and that means an opportunity for snowy, chilly fun. You can adapt your garden to the seasonal snow that lands in your outdoor containers or build your winter wonderland inside with artificial snow. Would your fairies love to create some friendly snowmen? An Earmuff Snowman, or even some Snow Owls, can be amusing and quirky, personality-filled additions to a fair climate miniature gardening adventure. 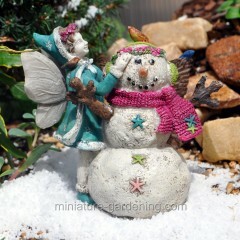 Consider using winter-theme fairy garden accessories to add charm. A well-placed snow shovel will have visitors reminiscing on the pleasures (and chores!) of past winters. Add snow by spreading fluffy, white SnoWonder on the surface of your container. If you are a do-it-yourself enthusiast, try building your snow-filled landscape with white cotton or even teeny-tiny white beads. These types of “snow” will pile easily into a shovel, wagon, or other miniature garden accessories. If you have had enough of the snow in your neighborhood and would prefer to theme your garden sans the fluffy stuff, there are still plenty of options for decorating the fairy garden for chilly temperatures and seasonal entertainment. You could build an ice-skating rink for your fairies using innovative materials like aluminum foil, glass tiles, or anything flat and reflective, or select a resin, Frozen Ice Skating Pond with a Cardinal. Lastly, add a simple fence border with a nearby cozy bench, and you will be ready for wintertime fun in the miniature garden. You can also keep your indoor miniature garden decorated with fairy garden accessories that are appropriate for the brisk, post-holiday months, like snowmen, snow animals, sleds, and even fairy garden residents who are dressed in their best Santa hats and scarves. For a snowless garden that still wants to get in the spirit of blizzards, Snowflake Picks are seasonally appropriate but can be stuck into soil, grass, or pebbles. What is the best part? They never melt! The winter months are also a fun and apt time to get out the fairy glitter or pixie dust and have some fun with it in the garden. A little sprinkle of white or blue glitter not only looks like snow, but it demonstrates the magic of the winter season. While at first, you might assume that winter is a time to forego any and all miniature plants and miniature trees, it can be one of the best times to plant something green. During the cold months, you are likely to bring your smaller gardens indoors, which is a great opportunity to swap out overgrown plants for newer varieties. If you want to scale back and try something low-maintenance for the winter, you could plant a few succulents, cacti, or even invest in some air plants that can sit gently on top of pebbles. A sand “garden” with stones, sand, and miniature accessories is another option. Also, consider a Zen garden, which is one of the latest trends in miniature gardening. 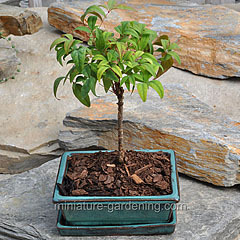 Bonsai miniature trees planted in small-scaled containers is a favorite pick by gardeners in 2019. Do you want to keep your designs outside? Go “faux!” Artificial plants are available in different sizes and types so that you can customize a miniature garden to your heart's content without worrying about the weather. For an indoor garden with a snowy look that will never melt, snow pine trees or other “snowy” miniature trees are not only low-maintenance, but they ask nothing of the climate. Therefore, whether your winter is warmer or colder than usual, or has more or less precipitation, you can achieve the look and feel that you are searching for in your seasonal miniature garden. Enjoy! This blog post was published on 01/17/2019 15:44:37.